Adapters for use on the DW402 grinder, 5/8"-11 shaft grinders to mount type 1 cutoff wheels. 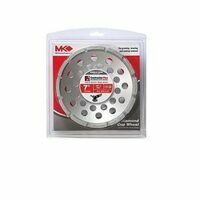 3" (76.2mm) x 1/32" (.79mm) type 1 steel cutting wheel with 3/8" (9.52mm) arbor. Aluminum oxide metal cutting wheel. Designed for metal cutting, metal abrasion, body work, metal fabrication and general repair work. Used on ferrous materials. Designed to be used on die and air grinders only. Wheel size: 3"; Thickness: 1/32"; Arbor: 3/8"; Maximum rpm: 25,450; Tool type: die/air grinder. Zirconia grit for faster material removal with type 29 fiberglass backing for optimal grinding angle of 20-25 degrees. Premium abrasive cloth for longer life. Zirconia grit for faster material removal with type 29 fiberglass backing for optimal grinding angle of 20-25 degrees. Premium abrasive cloth for longer life. Replacement cutters for bench grinding wheel dresser. Heat treated carbon steel. 10-1/2". Ideal for fast, heavy-duty cleaning of large surfaces, removing weld scale, rust, burrs, etc. Designed for use in high speed air and electric tools, both portable and stationary machines. Arbor: 5/8" - 11"; Wire size; .014" (.35mm). Maximum rpm: 14,000. Ideal for fast, heavy-duty cleaning of large surfaces, removing weld scale, rust, burrs, etc. Designed for use in high speed air and electric tools, both portable and stationary machines. Arbor: 5/8" - 11"; Wire size; .020" (.50mm). Maximum rpm: 12,500. Grinding and finishing metals in one step. Deburring and deflashing. Ideal for auto body repair, sharpening lawnmower blades. Aluminum backing. Zirconia grit for faster material with Type 29 fiberglass backing for optimal grinding angle of 5-15 degrees, allows full use of disc. Premium abrasive cloth for longer life. Grinding and finishing metals in one step. Deburring and deflashing. Ideal for auto body repair, sharpening lawnmower blades. Aluminum backing. Zirconia grit for faster material with Type 29 fiberglass backing for optimal grinding angle of 5-15 degrees, allows full use of disc. Premium abrasive cloth for longer life. Grinding and finishing metals in one step. Deburring and deflashing. Ideal for auto body repair, sharpening lawnmower blades. Aluminum backing. Made of durable rubber and used as a back support for resin fiber discs on Grinders; held in place by a lock nut. Can be cleaned with soap and water or a mild solvent. Zirconia grit for faster material with Type 29 fiberglass backing for optimal grinding angle of 5-15 degrees, allows full use of disc. Premium abrasive cloth for longer life. For metal fabrication, blending welds, cleaning, stripping and finishing. Built-in angle for grinding. Phenolic resin backing plate. 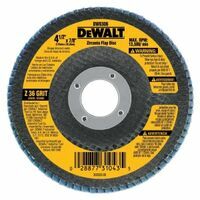 DeWalt Flap Disc, Coated, High Performance, Type 27, 4-1/2 in Diameter, 7/8 in Arbor/Shank, 60 Grit, Grade: Medium, Zirconia Alumina Abrasive, Fiberglass Backing, 13300 rpm Maximum, Applicable Materials: Carbon Steels, Aerospace Alloys, Nickel Alloys, Aluminum, Cast Iron and Stainless Steels DeWalt Flap Disc, Coated, High Performance, Type 27, 4-1/2 in Diameter, 7/8 in Arbor/Shank, 80 Grit, Grade: Medium, Zirconia Alumina Abrasive, Fiberglass Backing, 13300 rpm Maximum, Applicable Materials: Carbon Steels, Aerospace Alloys, Nickel Alloys, Aluminum, Cast Iron and Stainless Steels 4-1/2" with 7/8" arbor. For right angle grinders. Cuts fast and outlasts sanding discs. Great flexibility. Ideal for rough or fine finishing. Multiple layers of Zirconia cloth flaps constantly exposing new extra sharp grinding points. Laminated by state-of-the-art automated equipment. Reinforced fiberglass backing plate. Each disc balance tested for vibration free grinding/finishing. Wheel size: 4-1/2"; Arbor 7/8"; Maximum rpm: 13,300; Tool type: right angle grinder. 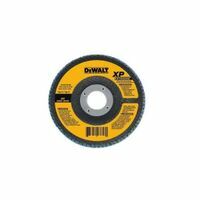 DeWalt Flap Disc, Coated, High Performance, Type 27, 4-1/2 in Diameter, 5/8-11 Arbor/Shank, 40 Grit, Grade: Coarse, Zirconia Alumina Abrasive, Fiberglass Backing, 13300 rpm Maximum, Applicable Materials: Carbon Steels, Aerospace Alloys, Nickel Alloys, Aluminum, Cast Iron and Stainless Steels 4-1/2" with 5/8"-11 arbor. For right angle grinders. Cuts fast and outlasts sanding discs. Great flexibility. Ideal for rough or fine finishing. Multiple layers of Zirconia cloth flaps constantly exposing new extra sharp grinding points. Laminated by state-of-the-art automated equipment. Reinforced fiberglass backing plate. Each disc balance tested for vibration free grinding/finishing. Wheel size: 4-1/2"; Arbor 5/8"-11; Maximum rpm: 13,300; Tool type: right angle grinder. 4-1/2" with 5/8"-11 arbor. For right angle grinders. Cuts fast and outlasts sanding discs. Great flexibility. Ideal for rough or fine finishing. Multiple layers of Zirconia cloth flaps constantly exposing new extra sharp grinding points. Laminated by state-of-the-art automated equipment. Reinforced fiberglass backing plate. Each disc balance tested for vibration free grinding/finishing. Wheel size: 4-1/2"; Arbor 5/8"-11; Maximum rpm: 13,300; Tool type: right angle grinder. 4-1/2" with 5/8"-11 arbor. For right angle grinders. Cuts fast and outlasts sanding discs. Great flexibility. Ideal for rough or fine finishing. Multiple layers of Zirconia cloth flaps constantly exposing new extra sharp grinding points. Laminated by state-of-the-art automated equipment. Reinforced fiberglass backing plate. Each disc balance tested for vibration free grinding/finishing. Wheel size: 4-1/2"; Arbor 5/8"-11; Maximum rpm: 13,300; Tool type: right angle grinder. 4-1/2" with 5/8"-11 arbor. For right angle grinders. Cuts fast and outlasts sanding discs. Great flexibility. Ideal for rough or fine finishing. Multiple layers of Zirconia cloth flaps constantly exposing new extra sharp grinding points. Laminated by state-of-the-art automated equipment. Reinforced fiberglass backing plate. Each disc balance tested for vibration free grinding/finishing. Wheel size: 4-1/2"; Arbor 5/8"-11; Maximum rpm: 13,300; Tool type: right angle grinder. Converts your angle grinder into a sander. Designed for use in angle grinders and is ideal for metal applications. The grinder/sander conversion kit includes (1) Back up pad, (1) M- 1.25 Locknut, (1) M- 1.50 Locknut and (2) 50 grit (coarse) fiber discs. Improves performance, extends sanding life and increases productivity. 5/8" Arbor. Grinder/sander conversion kit converts your angle grinder into a sander. Ideal for metal applications. Offers improved performance, extends sanding life and increases productivity. This kit includes (1) back-up pad, (1) 5/8" locknut and (2) 50 grit (coarse) fiber discs. 5/8" arbor. Back plate for type 27 depressed center wheels mounts 7" (177.8mm) and larger type 27 depressed center wheels, without arbor, to 5/8"-11 angle grinder shaft. Engineered to maximize runtime. High density grain concentration for fast cutting and low heat build-up. High performance ceramic grain stays sharp for fast, efficient cuts. 7/8" arbor. Engineered to maximize runtime. High density grain concentration for fast cutting and low heat build-up. High performance ceramic grain stays sharp for fast, efficient cuts. 7/8" arbor. Engineered to maximize runtime. High density grain concentration for fast cutting and low heat build-up. High performance ceramic grain stays sharp for fast, efficient cuts. 7/8" arbor. Premium zirconium grain blend is a superior quality formulation designed for fast material removal and long sanding life. Delivers up to 10 times faster material removal than a bonded grinding wheel. Combines 2 steps into one by simultaneously grinding and polishing. Type 29 conical design allows aggressive stock removal. 5/8-11 hub fits most angle grinders. Maximum speed: 12000 rpm. Premium zirconium grain blend is a superior quality formulation designed for fast material removal and long sanding life. Delivers up to 10 times faster material removal than a bonded grinding wheel. Combines 2 steps into one by simultaneously grinding and polishing. Type 29 conical design allows aggressive stock removal. 5/8-11 hub fits most angle grinders. Maximum speed: 12000 rpm. Premium zirconium grain blend is a superior quality formulation designed for fast material removal and long sanding life. Delivers up to 10 times faster material removal than a bonded grinding wheel. Combines 2 steps into one by simultaneously grinding and polishing. Type 29 conical design allows aggressive stock removal. 5/8-11 hub fits most angle grinders. Maximum speed: 12000 rpm. For use with handheld grinders. Steel reinforced with locking nut. 12,000 max rpm. Ideal for fast, heavy-duty cleaning of large surfaces, removing weld scale, rust, burrs, etc. Designed for use in high speed air and electric tools, both portable and stationary machines. Arbor: 5/8" - 11"; Wire size; .014" (.35mm). Maximum rpm: 8,000. For use with angle grinders. Diablo's Demon Grinding and Polishing flap disc combines two steps in one by simultaneously grinding and polishing. It delivers fast material removal. Ideal for working with metal and stainless steel. Diablo's Steel Demon flap discs feature a premium zirconium blend for up to 10 times faster material removal. The flap discs' special flap design offers flexibility and provides for a cushioned grinding effect. High performance flap discs combine two steps in one by simultaneously grinding and polishing. For use with Angle Grinders to grind and polish metal. Premium XP ceramic cloth for long life and fast material removal. For surface prep grinding, along with grinding and blending welds. 40 grit. 1330 max rpm. For use on all bench and pedestal mounted grinders for offhand deburring, sharpening, shaping and limited stock removal on all types of material. Telescoping plastic bushings allow the wheel to fit most standard arbor sizes. 3/4" blade thickness. High impact twist knot wire brush. Used in surface preparation prior to welding and for removing weld scale, spatter and heavy corrosion. Used for heavy duty cleaning applications. Arbor: 5/8" - 11"; Wire size: .020" (.50mm). Maximum rpm 20,000. Stringer bead brushes are extra narrow to clean pope welds between passes and other applications where a narrow brush face is necessary to do the job. Arbor: 5/8" - 11"; Wire size: .020" (.50mm). Maximum rpm 20,000. Designed for grinding angles of 20-25 degrees. Disc quickly removes material with aggressive grinding action. Featuring zirconia grit, which removes material 3 times fast than fiber resin metal sanding discs. Each disc is packed with a premium abrasive cloth that lasts 15 times long than fiber resin metal sanding discs. Evenly spaced holes prevents knotted wire tufts from shifting on the outer edge of the brush, providing a consistent brushing action. Fine/Medium for light duty; Coarse for general purpose and X-Coarse for heavy duty. 5/8"-11 Arbor-Max RPM 20,000. Carded. 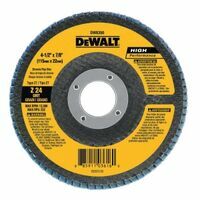 3"diameter for 4-1/2" to 5" angle grinders. 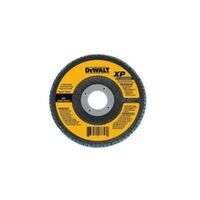 Recommended for DeWalt angle grinder Nos.DW400, DW402, DW814, DW458 and DW830. For heavy material removal. Use with 4-1/2", 5", 7" grinders, fits 9015A, 9005B, 9067L, 9069, 9524NB, 9527NB, 9527PB, 9528PB, 9557NB/PB, 9558NB/PB, 9564/CV, 9565/CV, GA7011C. Quick change hub adapter for right angle grinder, fits 4.5" and 5" right angle grinders with a 5/8"-11 thread per inch external shaft size, attaches easily, spin on/off, changes discs quickly, attach a variety of versatile grinding, sanding, and finishing discs without the need for wrenches, provides support while also allowing some flexibility to finish contoured or curved surfaces. Coarse for general purpose jobs. Applications: removes rust; cleans concrete forms, or use for automotive & RV repair. Ideal for fast, heavy-duty cleaning of large surfaces, removing weld scale, rust, burrs, etc. Designed for use in high speed air and electric tools, both portable and stationary machines. Arbor: 5/8" - 11"; Wire size; .020 (.50mm). Maximum rpm: 8,500. High density flap disc with depressed center. "Jumbo" Blue Zirconia. 4-1/2" with 5/8"-11 arbor. For right angle grinders. Cuts fast and outlasts sanding discs. Great flexibility. Ideal for rough or fine finishing the extra tough jobs. Long lasting, cooler running Jumbo style. Wheel size: 4-1/2"; Arbor 5/8"-11; Maximum rpm: 13,300; Tool type: right angle grinder. High density flap disc with depressed center. "Jumbo" Blue Zirconia. 4-1/2" with 5/8"-11 arbor. For right angle grinders. Cuts fast and outlasts sanding discs. Great flexibility. Ideal for rough or fine finishing the extra tough jobs. Long lasting, cooler running Jumbo style. Wheel size: 4-1/2"; Arbor 5/8"-11; Maximum rpm: 13,300; Tool type: right angle grinder. Aluminum oxide wheel. Designed for most stationary bench grinders. For general grinding and sharpening applications on mild steel. Not For Carbide Applications. Wheel size: 6"; Thickness: 3/4"; Arbor: 1"; Maximum rpm 4,100; Tool Type: Bench Grinder. Aluminum oxide wheel. Designed for most stationary bench grinders. For general grinding and sharpening applications on mild steel. Not For Carbide Applications. Wheel size: 6"; Thickness: 3/4"; Arbor: 1"; Maximum rpm 4,100; Tool Type: Bench Grinder. Aluminum oxide wheel. Designed for most stationary bench grinders. For general grinding and sharpening applications on mild steel. Not For Carbide Applications. Wheel size: 6"; Thickness: 3/4"; Arbor: 1"; Maximum rpm 4,100; Tool Type: Bench Grinder. For use with handheld grinders. Steel reinforced with locking nut. 12,000 max rpm. 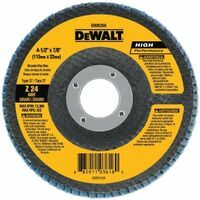 3"diameter for 4-1/2" to 5" angle grinders. Recommended for DeWalt angle grinder Nos.DW400, DW402, DW814, DW458 and DW830. For heavy material removal. Use with 4-1/2? to 5" angle grinders. 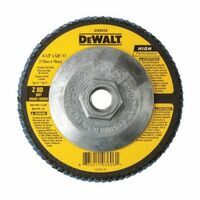 Recommended for DeWalt angle grinder Nos.DW400, DW402, DW814, DW458 and DW830. Crimped style for flexibility. Applications: Light Removal of Rust & Paint, & General Cleaning. Fine/medium for light duty; Coarse for general purpose and X-Coarse for heavy duty. Applications: weld cleaning, surface preparation prior to welding, removing rust, scale or oxidation, cleaning groves & corners. Fine/medium for light duty; Coarse for general purpose and X-Coarse for heavy duty. Applications: weld cleaning, surface preparation prior to welding, removing rust, scale or oxidation, cleaning groves & corners. Fine/Medium for light duty; Coarse for general purpose and X-Coarse for heavy duty. 5/8"-11 Arbor, Max RPM 20,000. Carded. For use with angle grinders. Diablo's Demon Grinding and Polishing flap disc combines two steps in one by simultaneously grinding and polishing. It delivers fast material removal. Ideal for working with metal and stainless steel. For use with Bosch grinder model Nos.1375A, 1347A, 1347AK, 1700A, 1701A, 1706AE, 1710A, 1711A, 1703AEVS. 7/8" shoulder. 5/8"-11 Thread - Carded High performance, high tensile, heat treated stainless steel wire provides long lasting aggressive brushing action. Internal holding plate construction provides reduces knot movement and increased control and brush life. For use on all bench and pedestal mounted grinders. 3/4" blade thickness, Type 1 wheel is designed for offhand deburring, sharpening, shaping and limited stock removal on all metal applications. Use with 4" angle grinders. Rugged knot construction .020" Type 302 Stainless Steel Wire is corrosion resistant eliminating contamination problem. Use with spindle mount washer (261039-0). For use with Makita Nos: N9501BZ, N9514B, 9523NBH, 9553NB. Applications: Use for tight operations, corners & angle welds. Ideal for fast, heavy-duty cleaning of large surfaces, removing weld scale, rust, burrs, etc. Designed for use in high speed air and electric tools, both portable and stationary machines. Arbor: 5/8" - 11"; Wire size; .020 (.50mm). Maximum rpm: 6,500. Knotted wire brush for use on angle grinders for tasks such as weld cleaning, rust removal, spatter removal and surface preparation. Use to clean weld beads, angle weld and corners in tight places. For roughening, deburring and surface cleaning prior to welding. Wire size: .023, arbor hole 5/8''-11. Maximum speed 14,000 rpm. For use on all bench and pedestal mounted grinders. 3/4" blade thickness, Type 1 wheel is designed for offhand deburring, sharpening, shaping and limited stock removal on all metal applications. For use on all bench and pedestal mounted grinders. 3/4" blade thickness, Type 1 wheel is designed for offhand deburring, sharpening, shaping and limited stock removal on all metal applications. Highly specified wire grades, .020, are constructed with internal holding plate to ensure consistency and safety. Constructed for even balance which provides smooth performance. Used for weld cleaning, stringer bead weld cleaning, removal of weld spatter, heavy encrustations, scale, flash removal, deburring, roughening for adhesion. High impact twist knot wire brush. Used in surface preparation prior to welding and for removing weld scale, spatter and heavy corrosion. Used for heavy duty cleaning applications. Arbor: 1/2" - 5/8"; Wire size: .020" (.50mm). Maximum rpm 9,000. Backing pad with spindle nut for sanding discs and buffing bonnets. Heavy duty and flexible. Maximum rpm: 10,000 Designed for quick de-burring, fast surface grinding and epoxy paint removal. The turbo segmented design is ideal for cleanup and finish work. Dresser for bench grinding wheel. Heat treated carbon steel cutters. To re-true and clean the surface of an abrasive wheel. 10-1/2" (266.7mm). High performance, high tensile, heat treated stainless steel wire provides long lasting aggressive brushing action. Internal holding plate construction provides reduces knot movement and increased control and brush life. For use with angle grinders. Diablo's Demon Grinding and Polishing flap disc combines two steps in one by simultaneously grinding and polishing. It delivers fast material removal. Ideal for working with metal and stainless steel. Use with 4" angle grinders. Rugged knot construction of .020" Type 302 Stainless Steel Wire is corrosion resistant eliminating contamination problem. Use with spindle mount washer (261039-0). Use with Makita Nos. : N9501BZ, N9514B, 9523NBH, 9553NB. Applications: Use for tight corners & angle welds. For use with 7" and 9" handheld angle grinders or sanders. Fits Makita angle grinder Nos.9067L and 9069; and angle sander No.9060L. Coarse for general purpose jobs. Applications: removes rust; cleans concrete forms, or use for automotive & RV repair. 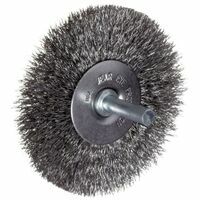 Flap Disc: 4-1/2",60 grit, 7/8" Arbor Hole; Cup Brush: 3" Knot Wire, 5/8"-11; Wire Wheel: 4" Standard Twist Knot, 5/8"-11. Use with 7" or 9" grinders/sanders. Made with .014" carbon steel. Direct spindle mount with spindle mount washer No.261039-0. For use with Makita Model Nos: GA7001L, 9067L, 9069; GA7911 & 9060L. For use on all bench and pedestal mounted grinders. 1" blade thickness, Type 1 wheel is designed for offhand deburring, sharpening, shaping and limited stock removal on all metal applications. For use on all bench and pedestal mounted grinders. 1" blade thickness, Type 1 wheel is designed for offhand deburring, sharpening, shaping and limited stock removal on all metal applications. Use with 4" angle grinders. Rugged knot construction ; .020" Type 302 Stainless Steel Wire is corrosion resistant eliminating contamination problem. Use with spindle mount washer (261039-0). For use with: Makita Nos: 9067L, 9069, 9077SL, 9566CV, GA7001L, GA7011C. Use for tight operations, corners & angle welds. Single row for general grinding and removal. For use on right angle grinders. Coarse for general purpose jobs. Applications: removes rust; cleans concrete forms, or use for automotive & RV repair. Designed for quick de-burring, fast surface grinding and epoxy paint removal. The turbo segmented design is ideal for cleanup and finish work. For use with angle grinders. Diablo's Demon Grinding and Polishing flap disc combines two steps in one by simultaneously grinding and polishing. It delivers fast material removal. Ideal for working with metal and stainless steel. For use with angle grinders. Diablo's Demon Grinding and Polishing flap disc combines two steps in one by simultaneously grinding and polishing. It delivers fast material removal. Ideal for working with metal and stainless steel. For use with angle grinders. Diablo's Demon Grinding and Polishing flap disc combines two steps in one by simultaneously grinding and polishing. It delivers fast material removal. Ideal for working with metal and stainless steel. Single row for general grinding and removal. For use on right angle grinders. MK Diamond Cup Wheel, Single Row, Series: Contractor Plus, 4 in Diameter, 5/8-11 Arbor/Shank, Applicable Materials: Concrete Used for rough grinding, deburring and fast material removal of concrete, masonry and stone. Designed for general purpose applications. Used for rough grinding, deburring and fast material removal of concrete, masonry and stone. Designed for heavy material removal. General grinding and removal, spiral turbo for a fast grind. For use with right angle grinders. MK Diamond Cup Wheel, Single Row, Series: Contractor Plus, 7 in Diameter, 5/8-11 Arbor/Shank, Applicable Materials: Concrete General grinding and removal, spiral turbo for a fast grind. For use with right angle grinders.